Want a chance to WIN BIG courtesy of Eggland’s Best? Scroll Down for 2 chances! 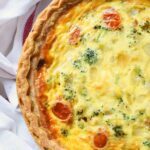 For years I have wanted to make my very own quiche at home. It was one of them recipes I would enjoy at brunches and mentally add to my running list of recipes to make at home. Finally, after legit years of being on my recipe backburner, I decided to make an Easy Broccoli & Tomato Quiche and boy am I happy I did! I want to emphasize the EASY part of this recipe. Since pretty pie crusts are not my forte, I decided to use a quality frozen pie shell. I have nothing against frozen pie crusts and really love them. They are such a tasty hack as long as you buy a good brand. The one I used was a little pricy but made for a deliciously buttery crust for my savory quiche. 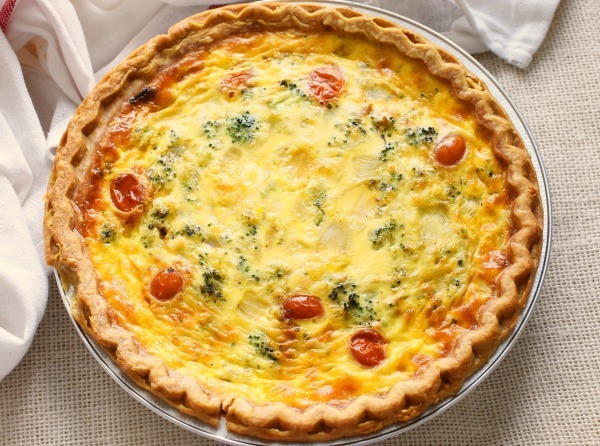 With any quiche recipe, eggs are the main star. I used Eggland’s Best Eggs for this recipe because they are delicious, and truly are the better egg (plus, they sponsored this post). 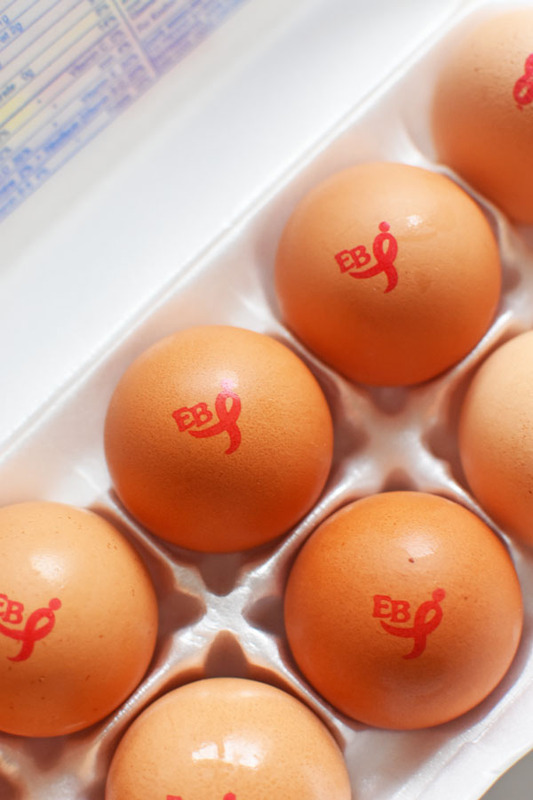 All sponsorship aside, Eggland’s Best Eggs (EB) are the No. 1 branded egg in the U.S. and are an excellent source of vitamins D, B12, E, B5 and Riboflavin. They have a whopping six times more vitamin D, more than double the omega-3, 10 times more vitamin E and 25 percent less saturated fat than ordinary eggs. 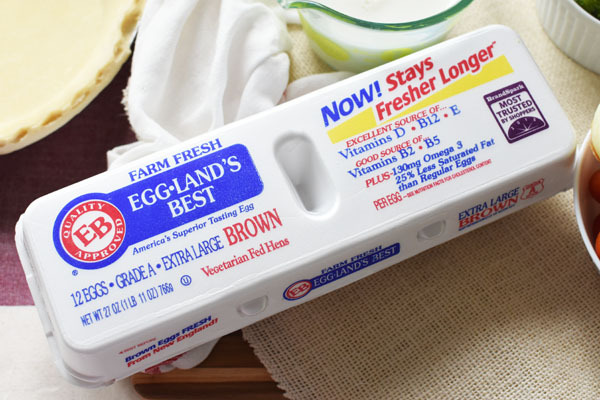 Independent testing has also confirmed that Eggland’s Best eggs stay fresher longer than ordinary eggs. Maybe it is just me, but knowing how much better Eggland’s Best Eggs are, makes them even more enjoyeable to me. I love how fluffy they helped to make my quiche. Plus, with all them added vitamins, I know my family was getting an extra nutritious perk. I added some pan-fried broccoli florets, sweet onion, and tomato to my quiche. These are some of my favorite omelete add-ins so I knew they would be yummy. Of course, no quiche is complete without cheese. Cheese really does make everything better! 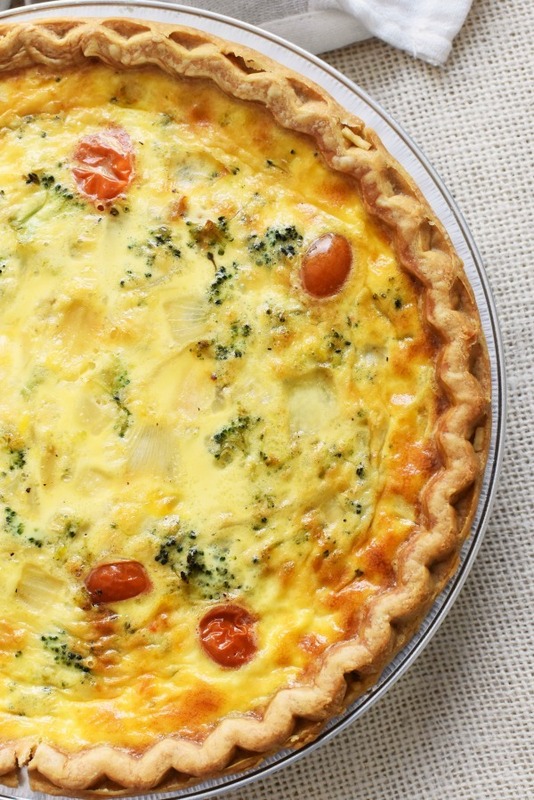 This quiche was so savory a made the best breakfast, lunch or really dinner. I mean it was that good. Sometimes you just need to mix things up. From now until December 22, EB is calling on fans across the U.S. to enter their city to win a visit from the EB Better Egg Truck. Fans can enter once per day, and share on Facebook or Twitter for an additional bonus entry. One lucky fan will also be selected at random from the winning city to receive an exclusive Better Brunch from the EB Better Egg Food Truck for them and their closest friends. Enter to win a $25 VISA using the giveaway widget below. Gift card delivery will be virtually. Gift card must be used online. US entrants only giveaway ends 11/6th at 11:59 pm est. A savory custard filled with seasoned broccoli, onion, tomato, and sharp cheddar cheese blend. Pre-heat your oven to 350 degree f. Poke 20 fork pricks into the crust. Pre-bake crust for 10 mins, and then remove from oven. 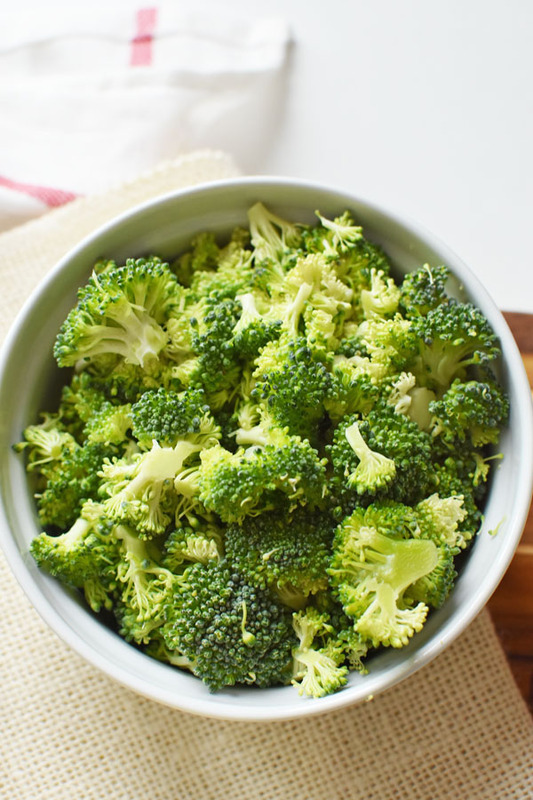 In a medium sized frying pan, pan-fry the onions, and broccoli with the oil and season for 3 mins. Add in the tomatoes and pan fry for another 3-5 mins. Once done, set aside. In a mixing bowl, Add eggs, yolks, and milk- beat until combined. Add cheese to pie crust, then veggies, and pour over eggs Bake for 30-35 mins or until done. 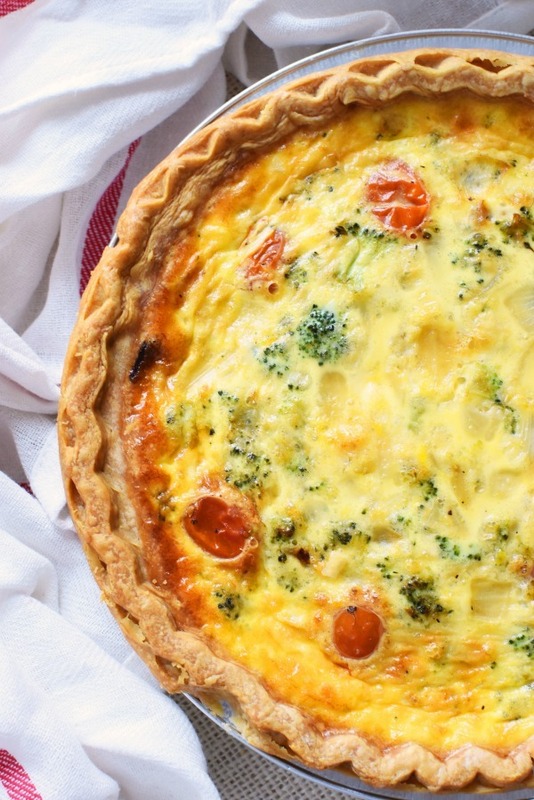 If crust is browning too much, loosely cover Quiche with a sheet of foil. Allow quiche to set for at least 15 mins. Enjoy warm! Leftovers can be placed in the refridgerator, and placed in a microwave, or toaster oven to re-heat. Eggs ovet easy or scrambled eggs. I’d love to use it for holiday egg nog. The freshest eggs and best vanilla make the most delish egg nog. I would make bacon and cheese omelets. Thank you! I would make a veggie frittata with Eggland’s Best eggs. I would make some really good omelets! I will make an egg sandwich with Eggland’s Best Eggs. I would make my Bacon, swiss cheese, mushroom and olives omelets. So delicious! I would make scrambled eggs with bacon. I would make French toast or egg burritos. I could make french toast. I would make a ham and cheese omelet. I would use the eggs to make French Toast. I will make a quiche. I would make eggs Benedict quiche with Eggland’s Best Eggs. I would make an omelet. 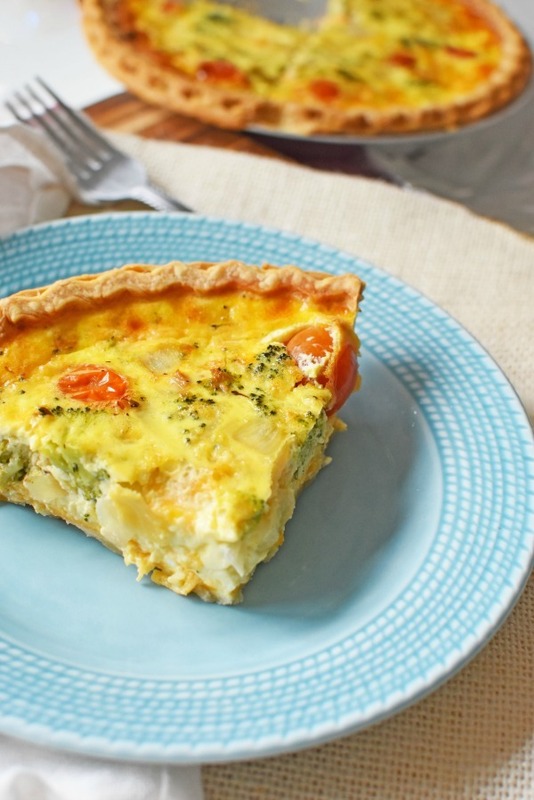 We love quiche, omelets and egg salad! I would make Creamy Lemon Squares. I would make my Egg Muffins cups! I would scramble eggs with ham and cheese. I would make a veggie omelet using Egglands best eggs. I want to make Huevos Rancheros with these eggs. I would make some fried eggs and bacon. I would make breakfast burritos with them. Thanks for the chance to win! I would make a fabulous everything omelet. I would make Potato Latkes. I would make ham and cheese omelettes. I would like to make a Grecian Omelet. I want to make a spinach quiche. I would make deviled egg sandwiches. I use them most every day..our fave way to use them is to make quiches. I would make a Toasted Bacon, Egg & Cheese Sandwiches. I’d make a ham n cheese omelet, so delicious. I would make a fried egg sandwich. I would make a swiss and mushroom omelet! That sounds so good right now!